Fossil fuel subsidies amount to hundreds of billions of dollars worldwide, and removing them has been held up as a key answer to climate change mitigation. Unfortunately, it is not the silver bullet many had hoped, according to an analysis led by the International Institute for Applied Systems Analysis (IISA) published in the journal Nature. 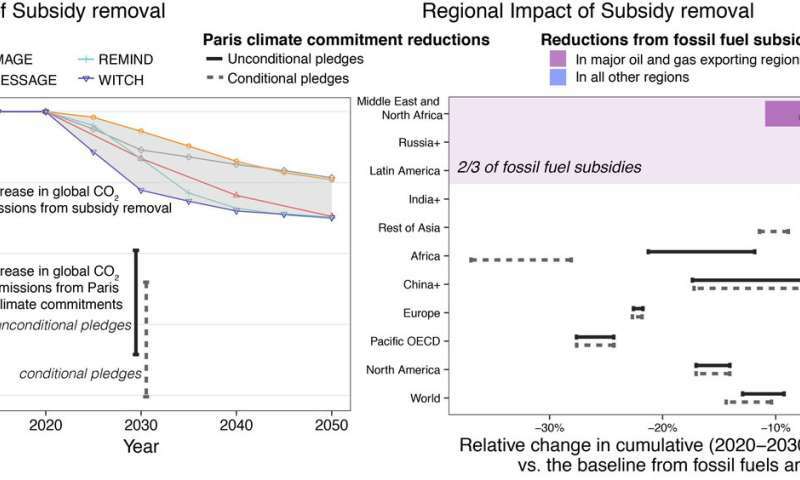 Removing fossil subsidies would only slightly slow the growth of CO2 emissions, with the result that by 2030, they would only be 1-5% lower than if subsidies had been maintained, regardless of whether oil prices are low or high. This equates to 0.5-2 gigatonnes (Gt/year) of CO2 by 2030, significantly less than the voluntary climate pledges made under the Paris climate agreement, which add up to 4-8 Gt/year and are themselves not enough to limit warming to 2°C. "The reason for this small overall effect is two-fold," says IIASA researcher Jessica Jewell, lead author on the paper. "First, these subsidies generally apply only to oil, gas, and electricity. That means that in some cases the removal of subsidies causes a switch to more emissions-intensive coal. Second, while these subsidies add up to substantial sums of money, the rate per unit of energy is not high enough to have a big effect on global energy demand, which would decrease by only 1-7% after subsidies are removed." In addition, subsidy removal would not boost renewable energy use significantly, the team found. This is because it is generally cheaper to reduce energy demand than to substitute subsidized fuels with renewables. Fortunately, the highest numbers of poor people are concentrated in the regions where removal of subsidies will have the weakest effect on CO2 emissions. Removing subsidies in richer oil and gas exporting regions would therefore provide significantly greater emissions savings and have a less detrimental impact on the poor. This is facilitated by today's low oil prices. "The governments of oil and gas producing countries are already under pressure to reduce spending on subsidies as revenues shrink," says Jewell. "This provides a unique political opportunity to remove subsidies in countries where it will have the largest effect on emissions and the smallest impact on the poor." Ultimately, these results do show benefits of removing fossil fuel subsidies, especially in certain regions, but care is needed for implementation. "We're not saying: don't get rid of subsidies, we're saying that we need to be aware that it might have less of an effect than hoped, and it could have a disproportionally large effect on the poor," says Keywan Riahi, study co-author and IIASA Energy Program director. "But well-designed policies can achieve subsidy removal without affecting the poor. A scheme being trialed in India, for example, removed subsidies on cooking gas in general but continues to support the poorest households through rebates." Recent number crunching shows that the Collective Annual Subsidies received by Oil & Gas co's worldwide are tipping in around 1 Trillion Dollars per year. Now, if ALL Subsidies were stopped Jan.01.2019 and redirected to Solar, Wind & Grid Power Storage & Fast Response system projects within those nations that use the subsidies, the changes would be most certainly seen, felt & acknowledge by mid 2020. Of course transportation of goods & products would be affected due to fossil fuel costs, so likely 25% of the subsidies should be focused on BEV's from passenger to commercial transport including shipping if/when feasible. There is amazing progress on that front too. This shouldn't be a surprise. Subsidies only detrimentally distort the economics of anything they touch. They do a great job for special interests. Consider the insanity and irony of providing subsidies to corn ethanol, which essentially is a synthetic fossil fuel. The money would be better spent on R&D, like a thorium reactor in lieu of uranium reactors. Another great irony is those supporting reduced CO2 emission should have gotten behind Trump's tax reform. It more than any subsidy discourages unnecessary housing development and the high structural carbon footprint which goes with it.